- Find new and effective techniques for dealing with difficult and negative people. - Learn some techniques for managing and dealing with anger. Dr. Stephanie will share five actions you can take today to see an increase in your emotional intelligence. Approximately two-thirds of all projects fail to meet their objectives, are not delivered on time, or cost more money than the budget planned for. The goal of every successful Project Manager (PM) and project team is to deliver the project on time and within the allocated budget. Discover 7 secrets of project management success! Customer service excellence will give you the competitive advantage you need to survive in a tough and increasingly uncertain business climate. In today’s customer-oriented business environment, "people skills" are critical for personal and organizational success. How you handle your customers can directly affect your individual goals as well as your team’s and company’s performance. This customer service webinar will provide you insight on the skills you need to communicate professionalism, gain respect, enhance customer relationships and secure an overall competitive advantage through customer service excellence. There is a connection between organizational ethics and business value. People do business with organizations they trust. Once consumer confidence has been betrayed, it is an uphill battle for businesses to recover--assuming that recovery is even possible. Establishing an organizational culture of ethical behavior is a strategic imperative for leaders. Perhaps they were mis-hired to begin with. Or, perhaps they were promoted well past their ability; perhaps they simply don't want to do what's required... You just don't know and you're spending a ton of your time analyzing the "why" and the "what. Perhaps you're thinking is "I'm spending my time for no return, when I could be spending it on someone else for recognizable value." Dr. Stephanie shares success strategies on working with the un-coachable. A brilliant strategy, blockbuster product or breakthrough technology can put you on the competitive map, but only solid execution can keep you there. You have to be able to deliver on your intent. Unfortunately, the majority of companies aren’t very good at it. This webcast will focus on exploring critical success factors related to improving strategy execution. Good strategic alignment has an amazing effect on organizational performance. People perform better when they fully understand and accept the purpose and goals of their organization, and they develop a better sense of ownership when they understand what difference they make in achieving those goals. On the other hand, lack of strategic alignment is one of the major causes for organizations to fail. Many organizations over time lose track of their key business purpose; they find it hard to answer the question: "Why are we in business?". This seems like a simple question with a simple answer; in reality however all too many businesses have lost sight of their key business purpose. Often this is caused by growth and diversification, often by shareholder centered rather than customer centered behavior, often because the self centered rather than customer centered objectives of top management blur the focus. As a result of this the strategic goals, business processes and organizational culture become misaligned, employees lose their focus, and customers lose their faith. Discover the strategies used by Fortune 100 business leaders in obtaining measurable business results. Success does not belong to a select few; success belongs to “you,” if you’re willing to go after it. Success is never handed out, you must take it, but you don’t take it by force. You take success by becoming a successful person internally. When you succeed on the inside, by taking on the thoughts of a successful person, the results will show on the outside. Discover seven life changing keys to success; these concepts will alter your life if you implement them. Have you ever wondered why so many misuse ... over abuse ... misunderstand the difference between management and leadership? Join us and discover the difference and how you can excel in both! Great leaders lead emotionally. Leadership is not only intellectual; it is also emotional. Leaders should be inspiring. morale, better productivity, satisfied customers and rising profits. • Research into the brain shows that emotions are contagious. • The leader's task is to create "resonance." • "Dissonance" is the enemy of great leaders. • Self-knowledge is fundamental to great leadership. Agility in execution is critical in today's challenging and complex business environment. Growing leaders at every level within the organization fosters agility in business execution. This webcast will focused on the 7 principles of leader development and the benefits of keeping the leadership pipeline primed with talent. Global leaders have been preparing themselves for the greatest challenges and opportunities of their lifetime. They have a chance at working together to turn upside down the way they approach the challenges they are facing in the world and to look at these challenges in a brand new entrepreneurial / intrepreneurial manner. There has never been a more exciting time for all of us to explore this great frontier where the boundaries between work and higher purpose are merging into one where doing good really is good for business. This new attitude is wired into the next generation. This workshop will be an open discussion surrounding what you can begin to do to function as a leader of impact to the global society. America's newest generation, the Millennials are in the middle of this coming-of-age phase of its life cycle. Its oldest members are approaching age 30; its youngest are approaching adolescence. Who are they? How are they different from -- and similar to -- their parents? How is their moment in history shaping them? And how might they, in turn, reshape the world in the decades ahead? As a manager, building the team for maximum effectiveness becomes one of your most important tasks and if you can create a climate where others find their motivation, they're more likely to do their best to stay there and perform better as a result. 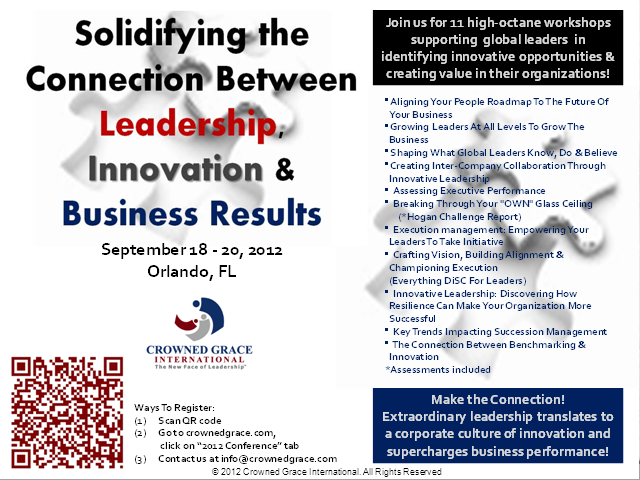 There is a great deal of value in enhancing your leadership skills. These events are focused specifically for those in management and leadership positions who desire to become more effective in leading their organizations. A certified executive coach will guide you through activities to focus on to guide you through your leadership journey.